Law Land, the son of John Land and Lydia Law, was born in Batley England in 1858. Elizabeth Sykes, the daughter of George Stell Sykes and Sarah Walker, was born in Yorkshire, England in 1858. Law Land and Elizabeth Sykes were married in Batley, England in 1880. They subsequently lived in Toronto, Canada, Detroit Michigan, Hoboken, New Jersey, Jersey City, New Jersey and Smithtown, Long Island. For more information on Law and Elizabeth, click on their photo. For information on their ancestors see surnames below. Family stories have been circulating for years that our branch of the Land family was related to Charles Lindbergh. "The only John in the Land family that I know of goes back to my great grandfather whose names was John Law [sic, should be Land, MLB]. He was my grandfather's (Law Land's) grandfather [should be father, MLB] and lived in London about 1875 to 1890......" [He did not live in London but in Leeds and Batley, England. MLB] John Law [sic, should be Land, MLB] was Charles Lindberg' (sic) s great grandfather too. Mrs. Lindberg (sic) was my grandfather's first cousin. Her father was Dr. Charles Land, a dentist, noted for his contributions to a method for making false teeth. His tools are on exhibition at the Smithsonian Museum in Washington." Charles born 1767 in Wakefield ,Yorkshire, England married Elizabeth Dunford. They had Charles Lewis born in Wakefield, Yorkshire in 1797. He married Anne Dinsdell. They had John born 1818 in Leeds, Yorkshire. John's second wife was Lydia Law. Their first child was Law Land born in Batley, Yorkshire, England in 1858. Law Land married Elizabeth Sykes in England. 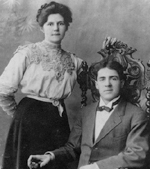 Law and Elizabeth immigrated to Canada circa 1880. They moved to Detroit circa 1890.They moved to Long Island circa 1900. John Land WAS Bud's great grandfather. "John Land was Charles Lindsberg's great grandfather, too." (This is Not true, MLB). "Mrs. Lindberg was my grandfather's first cousin." (This is Not true, MLB). "Her father was Dr Charles Land a dentist noted for his contribution to a method of making false teeth". His tools are on exhibition at the Smithsonian Museum in Washington (This is true, MLB). Kirk, Dinah and her father, Jonathan. The Jubbs were a prominent manufacturing family in Batley. The Land/Law families were not related to the Jubbs as far as I know. There were several Jubb/Sheard marriages. The Taylors were a prominent manufacturing family in Gomersall, Birstall Parish. The Land/Law families were not related to the Taylors as far as I know. For maps of Batley and Birstall Parishes, click on the 1906 Ordnance Survey Map of Water Lane, Holbeck, Leeds. To view the 1787 map of the area, click on the map of Batley. Sykes and Walkers lived in Adwalton, a village in the town of Drighlington, in Birstall Parish. For information on Adwalton, click on the photo of some houses in Adwalton. John Land, the father of Law Land, lived in Wakefield from 1849 to 1853. His ancestors, Charles and John Land, lived in Wakefield from 1767 to 1789. To view pictures of Wakefield, click on the photo of All Saints Church in Wakefield. For information on the town of Wakefield, click on the photo of the old building in Westgate, Wakefield. Horbury is a village three miles from Wakefield. Some of the earliest records for the name Land in the West Riding were in Horbury. John Land, the father of Law Land, lived in Leeds from 1818 until 1843. His father and grandfather lived in Leeds from 1797. In addition, Benjamin Law and his second wife, Lydia Sheard, were married in St Peter's in Leeds in 1801. To view pictures of Leeds, click on the photos of St Peter's Church in Leeds. The Lands moved from Wakefield to Leeds. For more information on Leeds, click on the photo of St Peter's, Leeds. Elizabeth Sykes' great grandfather, George Stell, was born in Fell Lane in Keighley parish. Ann Dinsdale the wife of Charles Lewis Land was born in Keighley in 1796. Ann's mother, Peggy Mitchel was born in Keighley in 1776. Peggy's father, John Mitchel, was born in Keighley in 1754. To view pictues of Fell Lane and Keighley, click on the photo of Fell Lane. For more information on the Stells in the Independent Congregation in Keighley, click on the photo of Fell Lane. Pictures of other towns in the area. Benjamin Law and his family moved to Stockport in the 1830s. William Law married Mary Worth of Wilmslow circa 1832. Michael Popplewell's Storey Tales from The Press, an independent Dewsbury newspaper. The Armley Mills Museum tells the story of the weaving industry in the West Riding of Yorkshire. For an explanation of the industrialized process with photos, click on the picture of Armley Mills. David Williams and Alan Farrar sought out some of the old mill buildings which are still standing around Batley. To see David Williams photos of these buildings click on the image of mill gate. For information about and pictures of life in Yorkshire, click on the postcard of the children at their tea. For information on housing in Yorkshire, click on the picture of the cottage. For information on children in Yorkshire, click on the picture of the children. The cause of death was generally not listed on the parish records. The records for the White Chapel in Cleckheaton listed the cause of death from 1793 and 1813 giving an indication of the fatal illnesses in the area. For more information, click on photo of the White Chapel. Samuel, Elizabeth, and Robert, the children of George Stell Sykes and Sarah Walker immigrated to Toronto, Canada between 1882 and 1884. Samuel and Robert remained in Toronto until (at least) the 1920s. To view pictures of Toronto, click on the postcard of Queen's Park, Toronto. Detroit, Pictures Law Land and family lived in Detroit, Michigan from circa 1892 to at least March 1894. To view pictures of Detroit, click on the postcard of Cadillac Square. Lydia Law Land, the daughter of William Law and Mary Worth and the widow of John Land, immigrated to Philadelphia, Pennsylvania with several of her children in 1883. Lydia's sister, Mary Ann Law, and her husband, Samuel Land, were already living in Philadelphia at the time. To view pictures of Philadelphia, click on the postcard of Fairmont Park. Hauppauge (Smithtown) and Central Islip are seperated by Town Line Road. Both Law and Percy Land lived at some point in Central Islip. The closest shopping area and the train station to where they lived in Hauppauge were located in Central Islip. Law Land owned property in Central Islip. In addition, both Law and Percy worked in Central Islip. On January 24, 1925 a total eclipse of the sun was visible from the hill behind the house of Percy and Meta Land. Tim Wiedenkeller, the son of Ted and Doris Wiedenkeller, released his first CD, "Milagros," in 2004. It is a collection of original classical banjo compositions which was featured on NPR (National Public Radio) in July 2005. As of October 2005, Tim is recording his second record, "Soul House" which is an eclectic production featuring original vocal songs. My father, Bud Land (deceased), the son of Percy Land and Meta Petermann, and the grandson of Law Land and Elizabeth Sykes for the information he collected on the family history and for his stories about the family. My aunt, Helen Land, the daughter of Percy Land and Meta Petermann, and the granddaughter of Law Land and Elizabeth Sykes, for the information she collected on the family history and for the photos she gave me. Justina Land Leler, the daughter of Bud Land, for the photos and documents she has shared with me. Julia Land, the daughter of David Wiedenkeller Land and Mary Mc Cleary, the granddaughter of Mary Land and David Wiedenkeller Land, and the great granddaughter of Law Land and Elizabeth Sykes for the information she collected on the family. All the wonderful people that Tom and I met on our trip to Yorkshire June 2002. So many people went out of their way to help us. Malcolm at the Batley Library, after helping me make copies of some articles, took us to the Batley News where Barry Salmon pulled the file on Benjamin Law and made copies of all the relevant articles. On one occasion we stopped for directions and a gentleman let us for about 15 minutes to the Armley Mill. Everywhere we went people were interested in our project and were exceedingly kind and helpful. My husband, Tom, who did a fantastic job of driving on the left side of the road, making many U-turns, finding parking places on narrow streets, and taking photos during our trip to Yorkshire in 2002. Dominic Lennon, descendent of Henrietta Sheard Johnson (1856) daughter of Joseph Sheard (1820) and Sarah Colbeck, who first contacted me by email in January 2003 and has sent maps, contributed information on the Sheards Batley and put me in contact with other Sheard researchers. Bruce Cheesman, descendent of Emma Sheard Parker daughter of Joseph Sheard (1820) and Sarah Colbeck, for information on Emma Sheard and Alfred Parker in Canada. Susan Hazell, a descendent of George Sheard (1802), for information on Sheards in Batley and for telling me about the Sheards in Herkimer County, New York. Andy Coates another Sheard descendant for information on the family of James Sheard and Ann Colbeck. Vivien Tomlinson for sharing her well researched and detailed information on the Sheards of Batley, November 2004. Her addition is a real gold mine of Sheard information. Malcolm Bolton for information on the Siddles in Hunslet and Holbeck, January 2005. John Hall for information on the Siddles in Gildersome and for putting me on to Yorkshire BMD, a really great site that finally enabled me to find the marriage record of John Sykes that I had tried for years to find through other on line services and LDS, January 2005. And for continuous input and information on the Siddles, 2006. Ruth Wooler Fry, the granddaughter of Polly Land Wooler and the Great-Great-granddaughter of Lydia Law and John Land, who wrote August 2005 and included information about her grandmother and her great aunt, Adelaide Land Daniels, and her family. Alan Farrah for information on the family of Ann Marie Sheard (1805-1891+) and Benjamin Farrar. David Walker for the genealogy of the family of John Parker (1690) born in Thornhill Lees, whose descendants where woolen manufacturers in Batley and whose descendant Alfred Parker married Emma Sheard (1842-1914). Admission: Adults. $2; Children. $1; groups by appt. Caleb Smith House only; others by appt. The Society is committed to discovering and preserving the history of Smithtown and Long Island through research conservation and education. 1700 farmhouse; architectural study house; by appt. Open: Mon.-Fri., 11AM-4PM; Sat., 12-4PM. Gallery in historic Mills Pond House hosts monthly shows; juried Fine Arts Competition, Photography Competition, and High School Competition; outdoor summer concert series; year-round gallery concerts; children's theatre, art classes, outreach bank galleries. Founded in 1886, the Society is the second oldest historical society on Long Island. Collections, exhibitions, and programs concentrate on the County's history and its people; museum, research library, archives, and education programs.